After years of pushing, Dillian Whyte is hoping to become the mandatory challenger to the WBC heavyweight title. The current champion, Deontay Wilder, will defend the title on May 18th against Dominic Breazeale at the Barclays Center in Brooklyn, New York. Despite Whyte being ranked as number 1 by the sanctioning body, the made Breazeale the mandatory challenger to the belt. Initially, the WBC had ordered a final eliminator between Whyte and Breazeale for the interim-title. But after Wilder's negotiations with Tyson Fury fell apart, the unbeaten champion decided to face Breazeale - after the sanctioning body ordered the fight. Whyte's promoter, Eddie Hearn, has questioned the decision and sent a legal letter to the sanctioning body. A meeting between both sides will take place this weekend. Hearn is hoping to reach a resolution where Whyte is installed as the mandatory challenger to the winner of Wilder vs. Breazeale. "It just doesn't make sense. 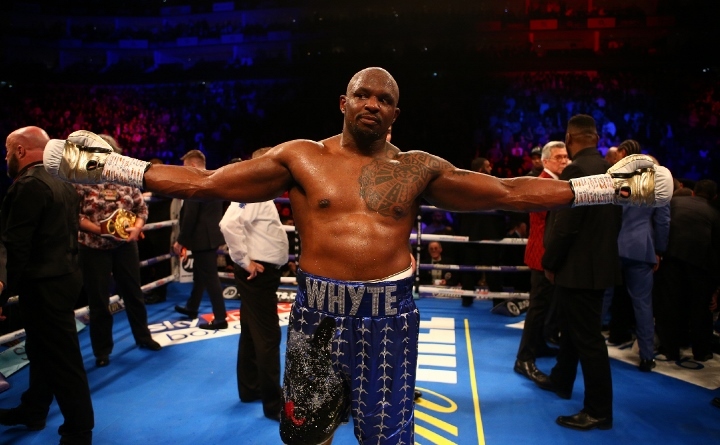 Dillian Whyte is WBC No 1, and more recently Dillian Whyte was ordered to fight Breazeale for the mandatory position. Everything is set up to suit Deontay Wilder, really, and I believe that Dillian Whyte should be next in line for a shot at Deontay Wilder. "We have a mediation session this Saturday with legal counsels to see what the WBC are going to provide as a resolution for Dillian Whyte, because he's worked his way up those rankings, and I actually believe the mandatory for the winner of Breazeale against Wilder should be Dillian Whyte. We'll see where we get with that."